In recent years the proud heritage of the Southern Confederate States has come under attack by those who have a political ax to grind. The Confederate Flag, and all Confederate symbols, have been made the subjects of derision by the left of center, politically correct news media and various groups whose only motivation is to create unrest and dissent for the purpose of furthering their own political agendas. This persistent and unwarranted hatred of all things Confederate, by a small minority of mostly un-educated, or mis-educated malcontents, has only served to fan the fires of pride and patriotism in a great cross section of Southern hearts. This welling-up of pride in Southern Heritage has consistently swelled the ranks of all Southern Heritage organizations across the South. Tallassee, Alabama is no exception; nearly everyone who is a native of this old Confederate town can trace their ancestry to one or more Confederate soldiers. Tallassee is unique in that it has the only Confederate landmark of it's kind still standing as a proud reminder of the struggle that was endured by the People of the South in an effort to keep the Free Constitutional Republic that was won for us by the sacrifices of our Founding Fathers. The landmark is the only existing Confederate Armory in the South and still honorably stands almost dead in the center of the Heart of Dixie, right here in the historic cotton mill village of Tallassee, Alabama. The Armory building is literally a solid granite monument to the fortitude and tenacity of the Southern people, who managed to hold off a superior force of invading yankee barbarians for four long years. 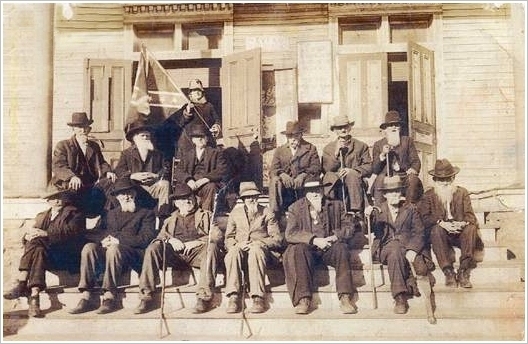 In May and June of 2000, a group of descendants whose ancestors were all part of that heroic defensive Confederate force over 140 years ago, came together to discuss the possibility of forming a new Camp of the Sons of Confederate Veterans in Tallassee, Alabama. For many of them, the need to revere and honor the memory of their ancestors was paramount in their motivation for endeavoring to form a new camp of the SCV. For all of them, the almost daily media slandering and harping against Confederate heritage and symbols by dim-witted and mis-educated liberal academics, and media race-baiters was even more reason to unite in defense of their honorable and noble ancestors, and the cause for which they fought and died. To you, Sons of Confederate Veterans, we will commit the vindication of the Cause for which we fought. your duty to see that the true history of the South is presented to future generations. In view of this charge given us by one of the last surviving Confederate Generals of that era, it is only natural that the responsibility for upholding and perpetuating the honor of the Confederate soldier, and the correct history of the Second War for Southern Independence, falls heavily upon those who have descended from such worthy sires. The men who formed the Tallassee Armory Guards were thus dutifully inclined to join with other of their Southern Brethren to aid in the preservation and perpetuation of the South's true and correct history. After informal preliminary meetings were held in May and June of 2000, the then 1st Lt. Comdr. of the SCV Alabama Division, Wyatt Willis came to Tallassee and gave the founding members a presentation and much-needed help and advice on how to proceed with getting the Camp chartered. On July 11th, 2000 the Camp was officially chartered and the 16 charter members voted to adopt the name "Tallassee Armory Guards", as there was in fact, an actual Confederate unit that called themselves the "Tallassee Guards." They were Company F of the 13th Alabama Infantry, a regiment mostly recruited from the counties surrounding Tallassee. At the time of their formation, there was no Confederate armory in Tallassee to protect. There was only a huge cotton mill complex which was already (in 1861) churning out thousands of yards of tenting and uniform materials each week to aid in the South's bid for independence. Part of this cotton mill later became a Confederate armory where carbines were made in hopes of supplying them to the cavalry commands under Gen. Robert E. Lee and others. The war, however, came to a close before the guns could be issued and to date only about 12 of the 500 carbines that were made there are known to exist. Among our now 175 plus members, there are some who are descendants of the original "Tallassee Guards" and they, along with the rest of us dedicated Confederate patriots, all work hard to help sponsor a WBTS reenactment every year in November as a fund-raiser for our various heritage defense and historic preservation efforts. Camp# 1921 currently meets at Fort Talisi, a 19th Century House now owned by SCV Camp 1921, on the 4th Monday of every month at 7:00pm. Be there at 5:30pm if you want to partake of the catered meal provided by member Larry Stearns. Camp 1921 has won the Alabama Division Camp of the Year Award seven times in the past 17 years, and has been very active in supporting various historical preservation projects, not to mention our avid defense of the Confederate soldier and Confederate symbols. Anyone interested in joining Camp # 1921 can find contact information on the Contact Us page of this website. The entire membership of the Tallassee Armory Guards, and the 53rd Alabama Cavalry reenactment unit, cordially invites all to join us each fall for a very family-oriented, fun-filled, and educational weekend event. Details about our event can be found elsewhere on this web-site. We would also like to encourage any of the ladies who visit this site to explore the page dedicated to our ladies auxiliary, " Talisi Cotton Belles, OCR Chapter 020." The Order of the Confederate Rose, OCR, is an opportunity for wives, daughters, friends, and even girlfriends of SCV members to participate in, and contribute towards, our ongoing efforts to honor and perpetuate the true history of our Confederate ancestors. We appreciate your visiting us and y'all please come again, ya heah! The Tallassee Armory Guards Camp shall be strictly historical and benevolent, non-political, non-sectarian and non-discriminatory. We reject and renounce all individuals and groups who misrepresent the history of the War Between the States. Furthermore, we reject and renounce all individuals or groups who use the Confederate Battle Flag or other Confederate Symbols for the purposes of promoting hate, racism and bigotry toward any individual or group. Copyright Â© 2017 Tallassee Armory Guards, Tallassee, Alabama U.S.A.